Synthetic peptide within Human Aquaporin 1 aa 250-350. The exact sequence is proprietary. Our Abpromise guarantee covers the use of ab168387 in the following tested applications. WB 1/1000 - 1/10000. Predicted molecular weight: 28 kDa. Formalin-fixed, paraffin-embedded human spleen tissue stained for Aquaporin 1 with ab168387 (1/250 dilution) in immunohistochemical analysis. Formalin-fixed, paraffin-embedded human colon tissue stained for Aquaporin 1 with ab168387 (1/250 dilution) in immunohistochemical analysis. Formalin-fixed, paraffin-embedded human breast tissue stained for Aquaporin 1 with ab168387 (1/250 dilution) in immunohistochemical analysis. Formalin-fixed, paraffin-embedded human kidney tissue stained for Aquaporin 1 with ab168387 (1/250 dilution) in immunohistochemical analysis. Formalin-fixed, paraffin-embedded human lung tissue stained for Aquaporin 1 with ab168387 (1/250 dilution) in immunohistochemical analysis. Immunocytochemistry/ Immunofluorescence - Anti-Aquaporin 1 antibody [EPR11588(B)] (ab168387)This image is courtesy of an Abreview submitted by Kirk McManus. Immunocytochemistry/ Immunofluorescence analysis of HeLa (human cervix adenocarcinoma) cells labelling Aquaporin 1 with ab168387 at a dilution of 1/200. Cells were fixed with Paraformaldehyde and permeabilised with 0.5% Triton-X100 in PBS. 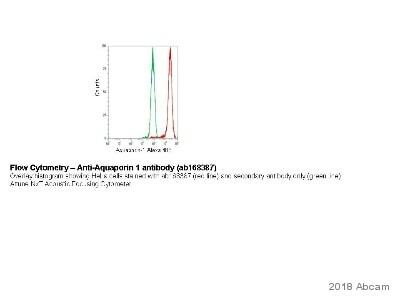 ab150081 (1/200) was used as the secondary antibody. The antibody produces a strong, membrane-associated labelling pattern in both MeOH and PFA fixed samples.